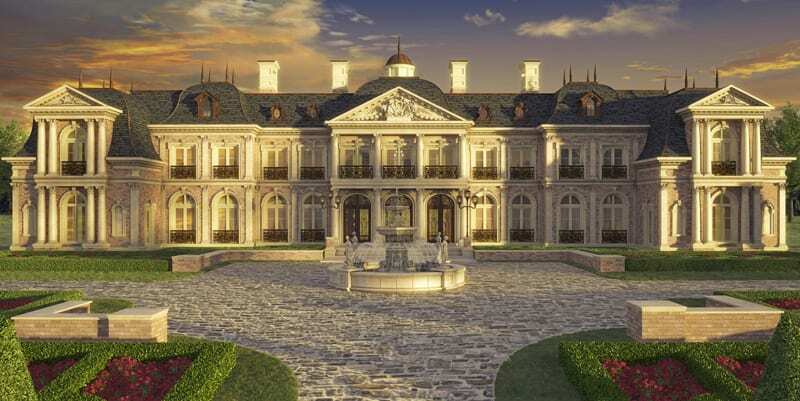 This grand estate home designed for a site in Great Falls, Va. boasts over 26,000 finished square feet. Detailed precast pediments, columns and cornices adorn this home. 12’ first and second floor ceilings bring drama and grand openings to the light filled foyer, galleries and ballroom. A central domed ceiling sits above mirrored grand staircases in the grand foyer. The ball room, foyer and family room open up onto a central rear terrace and pool with pool-house beyond.